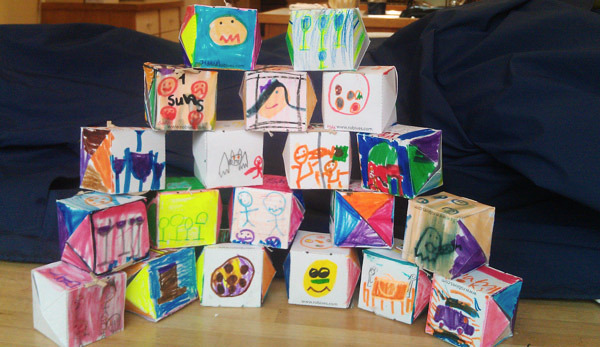 Jay, (Who you'll have seen in the comments on various blog posts as Najmanjay) Sent me this picture and report of making pop up cubes with 6-7 year olds at a school in Riverdale New York. It sounds like they had a great time! Thanks for sending it through Jay. "Rob, I just wanted you to see how your work with paper engineering has inspired a group of 6&7 year olds in SAR Academy, in Riverdale, NY. What you see here, is a pyramid (kindof) of cubes. 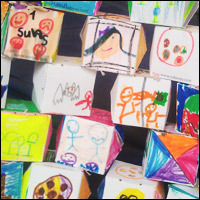 With the invitation of Ms. Sharon, their math enrichment teacher, I made these cubes with 20 children in the 1st Grade class at SAR. We explored the stability of the number four, (chairs and tables rely on 4 legs) and the prominent role that four plays in the upcoming Jewish holiday, Passover. We discussed the relationship between a fledgling nation's journey from a state of abject slavery to the unlikely state of desert survival. We realized that it must be hard to think about what it means to be free, if you have to worry all the time about food, clothing, shelter and the unforgiving desert. We thought it made sense that a holiday celebrating the independence and birth of a nation would give prominence to a shape/ number that symbolizes both vulnerability and stability. (see workshop notes on corrugations.) The pyramid, though most stable among shapes, fittingly represents the dilemma that characterizes the slave mentality: All my needs are taken care of, do I really need to be free? The kids got it that the more limited and vulnerable stability of the square represents an existence with enough support to free up the individual so that he/she can think about what it means to be independent, yet in need of others. In this way, the square serves as a dynamic and preferable alternative to the mummifying, yet much more impressive, pyramid. Just as the square depends on its four sides for its stability, a nation requires all its members to ensure its survival. Thus, if we are to survive as a nation, we must acknowledge and embrace those whose actions we applaud; and recognize, too, those whose actions we may deplore. Moreover, we realized that in order for us, as people to feel sturdy (their word) i.e., secure and stable as individuals, we must incorporate and learn to love and channel all the parts of ourselves, wise, naughty, confused, and inert, to help us live independently and productively. And so, the pictures you see, are pictures that these 1st graders drew to show the different parts of themselves that they want to welcome to their Passover celebration, or the different parts of the Passover celebration that play off of the number four, or, any part of Passover that makes them feel taken care of and "sturdy." Because these cubes snap up, I encouraged each child to hide their flattened cube inside their parent's Passover Haggadah (book telling the exodus story). As their parents open their book, they will be greeted with a delightful, yet ever-so-slightly annoying,springing cube, reminding them that this spring holiday is the time to embrace their children whether they are clever, or naughty, or, practicing being both at the same time."